Grip it. Flip it. Serve it. This utensil was originally conceived of as a “spa-tong-fork-ula” — a spatula, tongs and grilling fork all rolled into one. 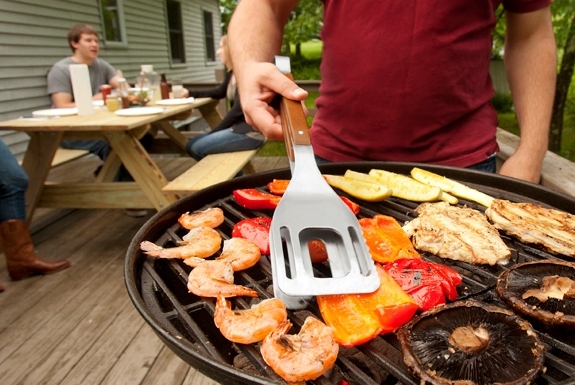 By the time the Stake BBQ Tool went through the Quirky crowdsourced design process, the all-in-one utensil also included a knife and bottle opener. Of those five functions, the two-pronged fork is the one we think is most cool; it slides out with the push of a thumb and then tucks discretely back into the spatula for storage. We also like how the wooden handles can be easily locked together and opened. But it’s the all-in-one-ness of the Stake that really makes it cool — and efficient when packing for camping or tailgating.